On the night of 17-18 December 1995, an aging Russian Antonov-26 plane dropped three weapons-laden wooden pallets over Purulia, a backward, nondescript district in West Bengal. Four days later, the same plane was force-landed at Mumbai s Santa Cruz airport, from where the mastermind of the operation, Kim Davy aka Niels Christian Nielsen, managed a daring escape. Who were the end-users of the weapons? Why were they airdropped over that particular region? Were they, as claimed later, meant for the shady cult, the Ananda Marga? Was it an effort to topple the CPI (M)-ruled state government of West Bengal? Or was it a conspiracy of international proportions, spanning continents and masterminded by a global superpower? As a reporter for The Telegraphand, later, the Hindustan Times, Chandan Nandy broke several stories on this bizarre covert operation. 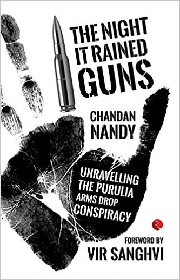 Nineteen years after the sensational arms drop, in this book, he exposes the grave lapses committed by India s security agencies and pieces together the story of how the operation was planned and executed. He brings to light as-yet undisclosed evidence about the end-users, whose identity still remains a mystery. Based on scores of interviews with R&AW, IB and CBI insiders and relying on classified documents, The Night it Rained Gunsis a riveting exploration of India s greatest security breaches. A senior assistant editor at The Times of India, Chandan Nandy has been an investigative reporter for The Telegraphand the Hindustan Timesin a journalistic career spanning nearly twenty years. He has also covered India s intelligence agencies, the home ministry, internal security and defence. He graduated from Brandeis University, Massachusetts, with a Masters in Coexistence and Conflict Resolution in 2006 and also went to what was formerly Presidency College in Kolkata.